Ground operations and airport processes represent a comprehensive and complex area which requires a broad range of different resources. A highly dynamic market environment causes a need for continuous process – redesign to ensure an efficient premium service-quality without losing sight of an optimal cost-benefit ratio. Because the majority of airport-processes are outsourced to contracted ground handling agents there is a vital need to combine these with efficient in-house operational strategies. In many aspects airport workflows are fairly nontransparent since a variety of tasks carried out by third parties are involved. To improve operational workflows, an extensive analysis, weighting and – if necessary – adjustment of all relevant daily procedures should be conducted to achieve optimal results. Key areas such as staff resourcing, staff productivity and quality of work bear a high potential for optimization, which we approach by conducting qualified inspections. A harmonized interaction between all systems is essential for the airlines success. 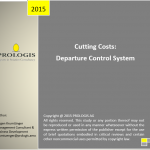 The ‘correct’ selection of DCS, Flight-planning, Reservation-, RMS and Revenue accounting systems, in regards to efficiency, costs and performance will lead to an immense reduction in your expenses. PROLOGIS’ experience in working with a number of E-Ticket related projects will help to ensure that airport staff implement effective business processes, allowing for a smooth transition, both from a customer service and IT perspective. The service quality offered is also one of the most important key factors. This applies to all parties involved, if you are an airline, an airport or a ground handling company, you will be measured by the performance delivered. PROLOGIS has more than 15 years of consulting experience, working with airlines and airports worldwide. Process analysis and re-design including the development and implementation of feasible approaches are our main focus. Our consultants have many years of experience in all areas of the operational airline and airport business.